CANDYLUXÉ CONFECTIONS is excited to announce the launch of custom curated, luxurious candy collections. This is not just another subscription box. When purchasing CandyLuxé Confections, you receive the highest quality of worldly confections—but you also empower adults with autism and other disabilities in a fun environment that celebrates their uniqueness. A monthly subscription includes complimentary shipping for $24.95/month. 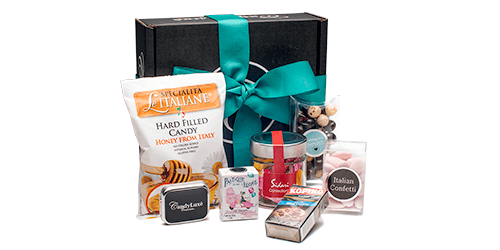 Each month you receive a different curated candy collection. The initial order is shipped within three (3) days of ordering. Subsequent months will ship within the first three (3) days of each subscribed month. The sweet love of candy confections started with a mother and daughter, Julieann and Hayley, and their love of sweets. Moreover, their love for Hunter—Julieann’s autistic son and Hayley’s brother. After exploring potential opportunities for Hunter as an adult with special needs, they concluded that none of the employment opportunities were going to provide a safe environment where Hunter’s passions could shine through his work. The Donohue family lovingly created CandyLuxé Confections to offer Hunter a stable, productive future in a comfortable environment. Hunter touches each box, lovingly packing its precious cargo. He takes his work very seriously and is proud of a job well done!